The New York State Republican Party wants donors to go to the races, but put their money down on their cause. 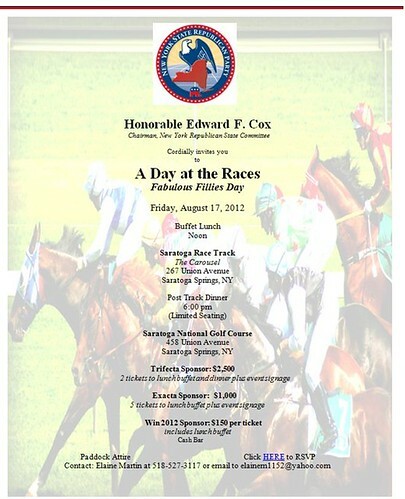 Chairman Ed Cox is hosting a fundraiser at the Saratoga Racetrack, with tickets going as high as $2,500 on Aug. 17 (unfortunately, that is not a giveaway day). The day starts at the track and concludes with dinner at the Saratoga Golf Course. Saratoga is a popular place for politicians from both parties to hold fundraisers, because, frankly, a lot of rich people go there. The Saratoga meet starts Friday. Print article This entry was posted by Nick Reisman on July 19, 2012 at 12:11 pm, and is filed under Ed Cox, Fundraising, Republicans. Follow any responses to this post through RSS 2.0. Both comments and pings are currently closed. Just goes to show that the NY and national GOP is the party of the rich snobs.